With blue ribbons and pens in hand, students came together Jan. 31 to organize the 100 Percent Renewable Day of Action. The day was centered around demonstrating student support for moving Vanderbilt toward renewable energy. 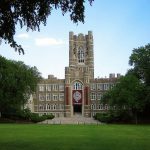 Specifically, the movement intends to convert Vanderbilt to 100 percent renewable electricity sources by 2030, and for all other sources by 2050. “This is really an opportunity for Vanderbilt, just in the self-interest of Vanderbilt, to become a leader in the south and in the country among educational institutions and to respect the wishes of the students, and then doing that all while simultaneously working to solve a global issue,” Keegan Campanelli, president of Students Promoting Environmental Awareness and Responsibility (SPEAR), said. The organization distributed blue ribbons for students to put on their backpacks to show their support for the cause. Members also collected signatures on petitions in Rand and in Commons on Jan. 31 and Feb. 1. By the end of the second day of gathering petitions, the students had gathered about 2,000 student signatures. The student’s plan is to use the petitions as a demonstration of student support when pursuing one-on-one conversations with faculty members regarding implementing the proposed plan. These meetings are going to start in the coming months, and they hope to meet with all of the administrators who have control in this area, Campanelli said. “Campus sustainability has become a much bigger issue, even in just the last couple years, so I do think the administration will respond,” participant Frances Burton said. The administration is aware of the student body’s interest in bringing renewable energy to campus and has begun to meet with various student groups, Vice Chancellor for Administration Eric Kopstain said. Furthermore, the university conducted the Large-Scale Renewable Energy Study and the BlueSky Energy Study, both of which began in fall 2017. Faculty, students, and administration have all expressed interest in moving toward renewable resources; however, the missing link has been clear communication between students and administration regarding the weight the issue holds among student communities, said Nathan Iyer, who organized the event alongside Campanelli. To better increase collaboration between the students and the administration, the organizers want to provide this feedback from the student body that administrative officials may not have, Campanelli said. The event came to fruition after non-profit organization Environment America reached out to Campanelli. Along with Vanderbilt, Environment America reached out to about 20 other colleges around the country to organize similar events on the same day, Campanelli said, though each day of action looked different at different schools. Environment America worked with Vanderbilt students to formulate the details of the proposed plan to move Vanderbilt toward renewable energy and to organize the event. The students involved in the Day of Action will continue to take action and conduct campaigns on campus for the remainder of the semester, Campanelli said. This event lacked the organization that the students would like to see moving forward, given that it was rushed in planning, Iyer said. Part of future action will come in the form of reaching out to other groups on campus to bring them into the cause. For Iyer, the mission of environmentalism is a personal one. After completing his first three years at Vanderbilt on the pre-medicine track, he decided to change his plans to pursue sustainability. To him, among the most important outcomes of this movement will be gaining understanding on how to communicate and change the messaging around environmentalism to meet the interests of the different communities on campus.